Sparked by an assessment from a top U.S. military commander, bloggers last week weighed in on the debate over whether to send more troops to Afghanistan. And for the second week in a row, questions about the role of race in attitudes toward President Obama generated heated commentary. For the week of September 21-25, 18% of the links were to stories about the situation in Afghanistan according to the New Media Index from the Pew Research Center’s Project for Excellence in Journalism. This is the highest level of attention to that subject since August 31-September 4 when it made up 26% of the links following an article by columnist George Will advocating a pullout. Last week, much of the discussion was in response to the September 21 Washington Post report on U.S. and NATO commander Stanley McChrystal’s confidential report warning that without additional troops, the likely outcome in Afghanistan would be failure. Most of the bloggers who commented on that issue backed McChrystal’s call for bolstering forces. 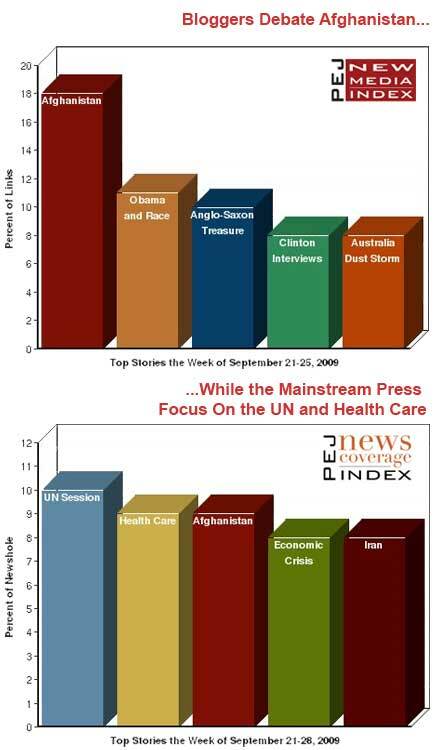 Afghanistan also ranked highly in the mainstream press news agenda last week, according to PEJ’s News Coverage Index. It was the third-largest subject, at 9% of the newshole. It finished behind the gathering of world leaders at the United Nations (10%) and the ongoing debate over health care (9%), neither of which were among the most- discussed issues online last week. The second-largest topic in the blogosphere, with 11% of the links, involved the previous week’s leading subject: Obama and the question of racism. (One week earlier, that subject accounted for 28%.) But this week, rather than former President Jimmy Carter, it was musician Dave Matthews who struck a nerve. In a CNN interview, the singer asserted that blatant racism is everywhere in the U.S. and that it has played a role in motivating Obama opponents, a claim bloggers overwhelmingly condemned. The next three largest stories among bloggers cut across a range of topics that received relatively little attention in the mainstream press. Third, with 10% of the links, was the largest-ever discovery of Anglo-Saxon treasure in Britain, 1,500 gold and silver pieces and dating back to perhaps the seventh century. That was followed by a different kind of discovery: previously unreleased interviews with former President Bill Clinton that will be included in an upcoming book, as reported by USA Today (8%). And fifth, also at 8%, was the dust storm that overwhelmed Sydney, Australia, last week. On Twitter, a streak came to an end last week. 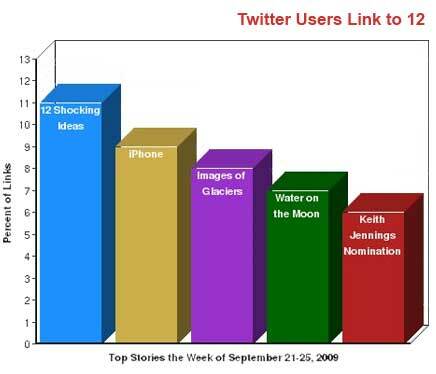 For six of the previous seven weeks, news about Twitter itself had been among the top three most linked-to stories. Last week, though, Twitterites broadened their focus. This time the top story, with 11% of the links, was a collection of 12 "Shocking Ideas" compiled by Wired magazine that had the potential to shape the world. From prisons to war to sports, "big thinkers" offered dramatic suggestions for change. The Apple iPhone was back in the mix at No. 2 as users voiced frustration with the service provided by AT&T. Third was a collection of pictures of glaciers taken from space. And fourth was the discovery by India’s first lunar mission of a large quantity of water on the surface of the moon. General McChrystal’s request for more troops in Afghanistan added fuel to the ongoing debate over the U.S. presence there. And the majority of bloggers who weighed in argued that a surge of troops, similar to that which occurred in Iraq, is necessary if the U.S. is going to win the war. A few opposed sending more soldiers into what they see as an unwinnable conflict. "This is the right time for anti-war activists to be stepping on the gas," responded Bruce Gagnon of Organizing Notes. "But the Democrats…cannot afford to have the peace movement on their backs in the 2010 Congressional elections. So they are in a position now where they must begin sounding like they have serious doubts about Afghanistan in order to cool down the public concern." But more than anything, bloggers couched their comments in political terms, mainly criticizing Obama for inaction. "How can you have 40,000-plus guys taking casualties and the commander-in-chief is giving speeches to school children, doing Letterman and keeps putting off a decision on Afghanistan?" asked Silvio Canto, Jr. "Pres BO’s next big decision is Afghanistan and it’s time to make a decision…Pres BO has all of the information that an executive needs to make a decision. So make it!" "This is unconscionable," added the Lonely Conservative. "We’re fighting a war in Afghanistan…The situation is dire. The president puts off a decision because he’s trying to ram through a socialist domestic agenda. He said he was committed to winning this war! If he’s changed his mind he ought to bring the troops home today." When CNN asked Dave Matthews if a lot of the animosity directed toward Obama was race-related, he responded, "Of course it is!" and added that racism in the U.S. is fairly blatant. Online, the comment generated a strong backlash. "This just reminded me why I’ve never liked Dave Matthews-and I didn’t even know he’s a jerk…until now," replied Giovanni’s World. "You see, Matthews thinks Americans really are racist. Matthews even knows what Americans are really thinking and saying BEHIND CLOSED DOORS!" "Idiot Musician Dave Matthews says racism is ‘Everywhere’ in America," posted Papa Mike. "Let’s see. He’s a left-wing musician who only hangs out with other lefty musicians and lefty celebrities, and he concludes from this that racism is all around him. Hmmmm…." "As far as people being ‘terrified’ of the President, did Matthews ever consider that it might have something to do with the man being a socialist hell-bent on destroying the country as we know it?" asked Jay G at Marooned. "Perhaps-and I know that this is a radical concept for someone raised on the ‘peace, love, and granola’ bandwagon-people disagree with Barack Obama because they have philosopical and political disagreements with the man and his policies?" On the morning of Tuesday, September 22, more than 250 tweets linked to a Wired magazine article entitled, "The Smart List: 12 Shocking Ideas that Could Change the World." Among the ideas in the piece was a suggestion from Naval Postgraduate School professor John Arquilla that the U.S. military should go on the "Cyberoffensive" and launch pre-emptive cyberattacks in order to deter lethal conflicts. Another came from University of Oslo criminologist Nils Christie who suggested that the U.S. dramatically cut its prison population by treating many crimes as "unwanted acts" that require counseling rather than jail time. A third, coming from two college professors, was that American sports leagues should adopt a concept from European soccer where teams have to earn their right to stay in the top divisions. Most of the Twitter users who linked to the story did so without comment and only wanted to share the piece. However, a few did express support for the exercise. "A great compilation of ideas that should be considered more seriously," wrote Craig Reck. "This might shake your perspective," suggested Sarah March. The second most popular video dealt with another controversy related to Barack Obama. It is a group of children from B. Bernice Young Elementary School in Burlington, New Jersey, singing a song praising the President. A number of conservative pundits have criticized the school and song, claiming that it indoctrinated students to support Obama and his policies. Defenders of the school say that the song was part of Black History month and not an attempt to force a specific set of political views. The New Media Index is a weekly report that captures the leading commentary of blogs and social media sites focused on news and compares those subjects to that of the mainstream press. PEJ has launched the New Media Index as a companion to its weekly News Coverage Index. Blogs and other new media are an important part of creating today’s news information narrative and in shaping the way Americans interact with the news. The expansion of online blogs and other social media sites has allowed news-consumers and others outside the mainstream press to have more of a role in agenda setting, dissemination and interpretation. PEJ aims to find out what subjects in the national news the online sites focus on, and how that compared with the narrative in the traditional press. A prominent Web tracking site Icerocket which, monitors millions of blogs, using the links to articles embedded on these sites as a proxy for determining what these subjects are. Using this tracking process as a base, PEJ staff compiles the lists of links weekday each day. They capture the top five linked-to stories on each list (50 stories in all each week), and reads, watches or listens to these posts and conducts a content analysis of their subject matter, just as it does for the mainstream press in its weekly News Coverage Index. It follows the same coding methodology as that of the NCI. This process allows us to compare the New Media commentary, based on the Icerocket list of links, with the commentary in the traditional press. Note: When the NMI was launched in January 2009, another web-tracking site Technorati was similarly monitoring blogs and social media. PEJ originally captured both Technorati’s and Icerocket’s daily aggregation. In recent months, though, this component of Technorati’s site has been down with no indication of when it might resume. The priorities of the bloggers are measured in terms of percentage of links. Each time a news blog or social media Web page adds a link to its site directing its readers to a news story, it suggests that the author of the blog places at least some importance on the content of that article. The user may or may not agree with the contents of the article, but they feel it is important enough to draw the reader’s attention to it. PEJ measures the topics that are of most interest to bloggers by compiling the quantitative information on links and analyzing the results. The Project also tracks the most popular news video on YouTube each week. *For the sake of authenticity, PEJ has a policy of not correcting misspellings or grammatical errors that appear in direct quotes from blog postings. Note: PEJ’s weekly News Coverage Index includes Sunday newspapers while the New Media Index is Monday through Friday. Due to a technical glitch, the most-viewed YouTube news videos were captured several days later than normal. Videos about events that occurred after Friday, September 25, were removed from this list.